My last post was about my trip to Argentina. 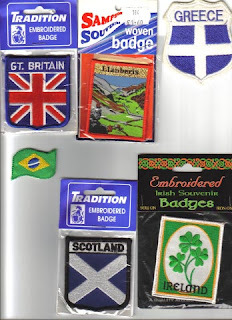 A few years ago on one of my early trips I decided to collect patches, a symbol of where I have been and maybe an understanding of where I am going. 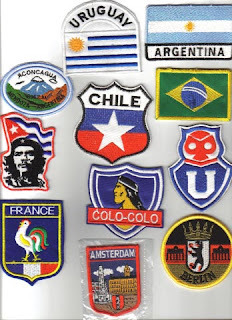 Some of the new ones from South America, as well as a few stragglers from elsewhere. My favourite place has got to the land 'down under'. When I visit Australia, I feel at home even though its 13,000 miles from Ireland. It feels like a place where I belong. We have lost something in UK & Ireland. We have lost what it is to live as we are too busy living, paying bills, rushing around. I hope to go to Australia for atleast 4 years starting next March. I have plans to go to Uni, sort of "Educating Rita" style. I will probably be as old as the lecturers. 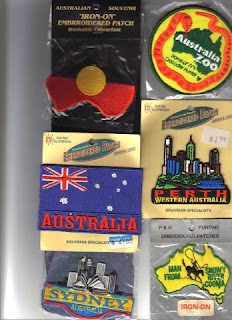 My yellow patch "Man from Snowy River" was a gift from my relatives in Australia when they visited Ireland in 1988. It opened by heart and mind to the world around us. My passion for travel and adventure stems from this. The people are polite and friendly...that used to be our description...not anymore. One of the places which changed my outlook on life was my journeys to places like Kenya, Peru and Nepal. Humbling. It still is had to accept our imbalanced planet with our desires and needs when others just hope for food, water and shelter. 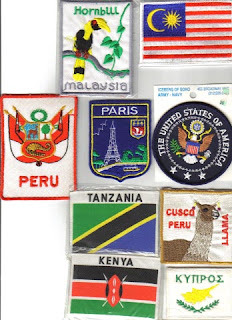 Tucked into the middle of this group is my little patch from France and the USA. An odd pairing. You have got to respect the French. They are a truly wonderful people. The attitude of not really giving a damn about other nations views is pretty similar to the USA. I love France, I just wish my abilities with their language weren't so rudimentary. Maybe one day. I have an uncle who is buried in a war grave in Northern France. Its a truly beautiful country and they have every right to defend their language and culture. Vive la France. One of the poorest nations on Earth, forced into poverty by the bully boy tactics of their next door neighbour. Yet despite this, they have free education and free healthcare. They have a student teacher ratio and a doctor patient ratio which makes the NHS look like its run by witch doctors. The benefit from some of the advances in medicine we can only dream of. Sure they have a few issues about democracy, but then who is to say our systems are better (Paisley, Adams and co or George W and Tony B). 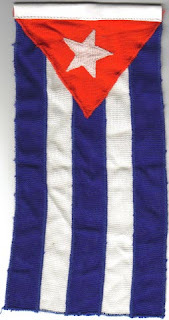 Its Cuba of course. Go visit and Enjoy. Stay clear of package deals to Varadero etc and you'll have a ball. As we struggle with our assembly and the scots with independence you can't help wondering where it will end. Hopefully with peaceful settlements which respect our difference as well as our similarities. Irelands Call? need I say more.